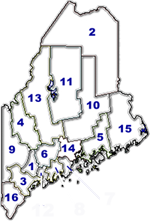 Kennebec County, west-central Maine, U.S. It is a region of rolling lowlands with higher elevations on the northwest. Foremost among the county's many streams is the Kennebec River, which traverses it from north to south and supplies hydropower for several cities. Other major waterways are the Sebasticook, Sheepscot, and Eastern rivers, while Great Pond and Cobbosseecontee, Messalonskee, and China lakes are among the largest lakes. The major forest types are spruce and fir. The city of Augusta, an early colonial trading post, is the state capital (from 1831) and the seat of the county, which was created in 1799. The county's name is derived from an Abnaki Indian word meaning "long lake." Its notable landmarks are Fort Western (built 1754), the State House (built 1829–32), and the University of Maine at Augusta (opened 1965). Other cities are Hallowell, Gardiner, and Waterville, which is the home of Colby College (founded 1813). Winslow contains Fort Halifax (built 1754; reconstructed 1988), which was the oldest extant blockhouse in the United States until it was destroyed in a flood in 1987. In addition to state government activities, the economy relies upon the manufacture of textiles and paper products, livestock raising, tourism, and health care services. Area 868 square miles (2,247 square km). Pop. (1990) 115,904; (1996 est.) 116,214.